My previous blog post is about comebacks. Addie’s restaurant recently re-opened in a new location in Park Potomac after a four-year hiatus. “Curb Your Enthusiasm” returns to television on October 1. And here’s another return I’m excited about: New Kitchens on the Block (NKOTB). 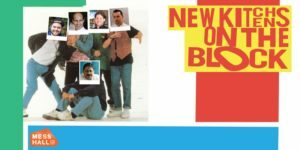 New Kitchens on the Block (NKOTB) 3.0 takes place at DC’s Mess Hall on Sunday, October 8 with an exciting new line up of chefs previewing their upcoming restaurants. This not-to-be-missed event offers participants a chance to sample signature dishes and drinks from 11 soon-to-open restaurants, all under one roof. NKOTB 3.0 takes place at Mess Hall (703 Edgewood St NE, Washington, DC 20017; messhalldc.com) on Sunday, October 8, 2017 for two separate two-hour sessions: 11 a.m.-1 p.m. and 2-4 p.m. Tickets are available on EventBrite. General admission is $65 and VIP tickets, which include gift bags, are available for $105. Event sponsors include Trimark Adams Burch, CohnReznick, Triple Seat, OpenTable, Congressional Seafood, and WDCEP.